Dallas is one of the ten largest cities in the United States and the heart of the largest metropolitan area in Texas. It is the county seat of Dallas County and small portions of the city also extend into the neighboring counties of Collin County, Denton County, Rockwall County, and Kaufman County. 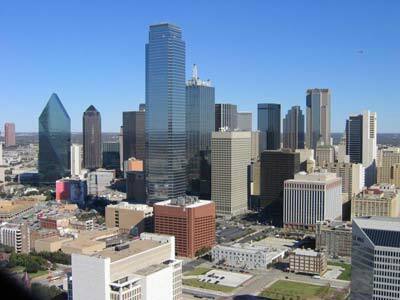 Dallas is the largest city of the Dallas/Fort Worth Metroplex, a large metropolitan area in North Texas. The Metroplex had a population of 5,589,670 aprox. The Dallas/Fort Worth area is sometimes called "Texas' Silicon Valley". Also, there are more than 40,000 telecommunication employees in the "Telecom Corridor" housing such companies. Dallasites are said to consider themselves more sophisticated than those in other parts of Texas, especially Fort Worth. Because of the economic prowess of the region, many who live there had come from other U.S. states or countries worldwide. Dallasites eat out about four times every week, which is the third highest rate in the country. Dallas has two times the number of restaurants per person than New York City. Dallasites are very fond of their local teams especially "America's Team," the Dallas Cowboys. The Cowboys are well loved by the locals, even after many lackluster or losing seasons, and even if another local team is a leader in its sport. Sports calendars and other memorabilia are very common, and on Sundays people tend to watch sports games on television. Because Dallas and Houston are the two major economic centers of Texas, they enjoy a friendly rivalry. Selected characteristics of them are often compared. One major comparison is the populations of the two cities. Dallas is served by two commercial airports: Dallas/Fort Worth International Airport (known as DFW International) and Dallas Love Field. In addition, Dallas Executive Airport (formerly Redbird Airport), is a general aviation airport located within the city limits, and Addison Airport is another general aviation airport located just outside the city limits in the suburb of Addison. Dallas Area Rapid Transit (DART) is the Dallas area public transportation company, providing buses, rail, and HOV lanes. DART began operating the first light rail system in Texas (and the Southwest United States) in 1996 and continues to expand its coverage. Dallas has the highest number of shopping centers per capita in the United States and North Park Mall draws in more revenue per unit area than any other retail complex in the U.S. The Kalita Humphreys Theater, designed by architect Frank Lloyd Wright, is the main home of Dallas Theater Center, the nation's oldest regional theater company. Dallas is home to two of the greatest men's choruses in the world: the Vocal Majority, an a cappella pops chorus and the Turtle Creek Chorale, the world's largest gay men's chorus. # Fair Park also hosts the largest state fair in the country, the State Fair of Texas. Fair Park is also the site of the largest Cowboy in the World: Big Tex, a 52 foot (16 m) tall speaking cowboy statue. The University of Texas Southwestern Medical Center at Dallas--a medical school and research university for graduate level science adjacent to Parkland Hospital--is home to four Nobel Laureates: three in physiology/medicine and one in chemistry. Dallas has expanded its Convention Center facilities to over 2 million square feet (185,000 m²). The Center is now capable of accommodating up to 4 major conventions at one time and provides roof-top helicopter landing facilities. Aside from a few exterior shots, the television program Dallas (1970s - 1980s), was not filmed in Dallas. Nearly all filming and production took place in Southern California. North Texas sits near the edge of the North American craton. The greater Dallas-Fort Worth metroplex sits on gently tilted sediments. People enjoy searching for fossils in the rocks around Dallas. Remnants of dinosaurs and Late Cretaceous marine reptiles such as Mosasaur are found. The Trinity River (Texas) has been important in shaping the DFW metroplex. Dallas was situated at the best ford, downstream from where the Elm Fork joins the main stream, where the river flows SE over the chalk. This provided a place where travellers need only cross the river once, at a place with relatively firm landings and bottoms.